Contrary to the opinion of quite a few people, working with profiles can be very useful if you often change material or nozzle size. But...Have you ever and over and over tried to create profiles and it did not work so well? While having a model in Cura. Then, in the Preferences Window maybe you selected a Profile and choose to ("Uuhhhh, does this mean Copy? I think so...") it with another Name ("Than I can edit and save that copy, is it not?"). UNFORTUNATELY that is not possible!!! Sorry man!!!!!! After you renamed the duplicated Profile in the "Duplicate Profile" Window and clicked the [Ok] Button there appeared no Custom profile. So the result was nil, null, nothing, zero, just as it was with me. What I discovered after a lot of trial and error was that there is only one good way to create your own Profile. 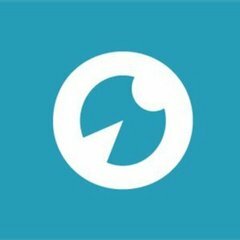 Create profiles without a model in Cura! 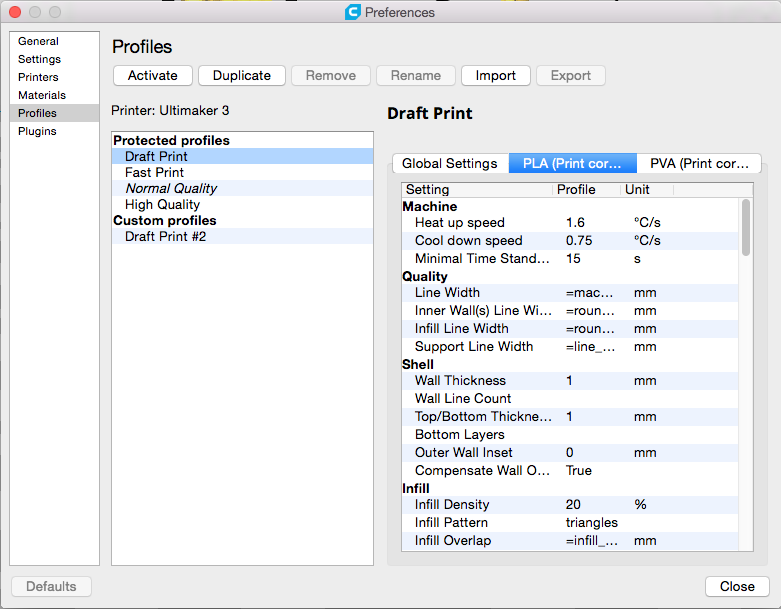 Navigate to the the right pane of Cura and select in the Nozzle & Material droplists the desired values for your Profile to create, these values are the first input conditions for that Profile!!! Then select a profile matching with these inputs. You will see some parameters change according to that profile. Unfold the Profile droplist and see that "Create...", "Update..." and "Discard..." are disabled. 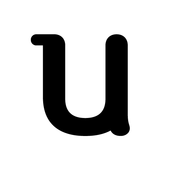 Ok, now leave that list, change some value in "Print Setup" and see a star appear in the droplist. This means that the current setting is no longer according to the current Profile. Unfold the Profile droplist again and see that "Create...", "Update..." and "Discard..." are now enabled. Click "Create profile from current settings" and create it with your own custom profile name which will appear in the Custom Profile list. 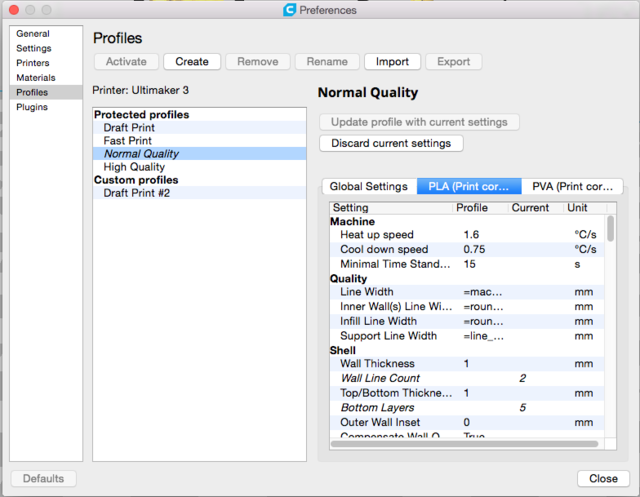 After more editing of the profile in the right Pane you can "Update Profile with current settings"
Having many profiles is not superfluous but very handy, especially if your own grey "Print Setup" memory is a bit fuzzy..... ("What were my best working settings for that Filament, four months ago?"). Hoping its useful for some of you, it was for me!!! Yup it is a bit flakey. I wanted to save changes to a new profile whilst I was working with a new model which was causing the changes and found I could not save to a new profile, I could only overwrite the existing profile. I chose that option and wrote down the changes I had made, which are displayed before committing the update. Nothing like an electronic system to cut paperwork!!! I hoped the guys add a folder structure for profiles by the time we get to 2.4 otherwise I will be tearing my hair out. Slic3r had one 3 years ago. Having a model inside Cura won't change anything with regards to being able to save a profile. I'm 100% sure about that. Those bits of code aren't even aware of each others existence. Current settings are changes that you made, but have not saved yet. If I might be so bold to make a suggestion... If instead of writing a ranting story, you write down a concise list of things that work unexpectedly, it is less work to read through for developers and the chances the bugs get fixed are much higher. You could have simply made a post stating "creating a profile when I have a model loaded does not seem to work" (which, by the way, I cannot reproduce) or "duplicate profile is confusing me, but I found this workaround: ...". Update: reason I cannot reproduce the error is probably because I am running Cura from the github source, where it has already been fixed. Hi, for the avoidance of doubt, the problem I had was that I had "Part A Profile" loaded and whilst preparing a piece for printing I made several changes to the settings . I decided I did not want to save those settings to the Profile but instead save them to a new profile "Part B Profile", this does not seem possible as at that instance the Duplicate option is not available. I do not consider it a bug but it would sure be helpful if it was possible to duplicate "on the fly"
Good to hear the quick menu in the sidebar on the right has made it possible for you to create a profile from the current settings or update it. Note: When you are in the profile manager, with the current profile selected (italic font), the 'duplicate' button changes in a 'create' button. The 'create' button creates a profile from those currently active settings instantly! When you manually select a different profile in the menu, the 'duplicate' button will simply duplicate that profile, without changing your current settings. Hi @jerooney, yes all OK now, many thanks for your help. Currently in the Profile Manager the custom profiles are listed in either a random sequence or in creation date sequence, not sure which. I will soon have about 20 profiles, which will grow further; is it possible to change this and display the list in alphabetical sequence to make it quicker to find the profile one wants? Unfortunately the profiles are listed in alphabetical order and cannot be changed at this point. Try to 'trick' the profiles by using smart names or numbers to order them to your liking. Working with profiles is under constant improvement, so keep an eye out on new Cura's! Lol I was looking at the manager today, before seeing your post and yes they are in alpha sequence - they were not, for me, a few days ago!